PayPal integration is now available! We've just released one of our most long awaited requests: the ability to import your data from PayPal! From this week, you can now import your PayPal Invoices and fees directly into Craftybase using our new sales channel integration. How do I connect to my PayPal account? Once you have connected via our secure authentication process, we will automatically download your PayPal Invoices and any PayPal fees you have paid on these invoices. As a bonus, if you also have an Etsy or Shopify sales channel already connected and also process payments for these orders via PayPal, we will also start magically fetching payment information and fees for these orders as well. One important thing to note: As we import only order related information, you will find that none of your purchases made through paypal or orders placed via other unsupported sales channels will be imported as part of this process. Not selling via PayPal yet? PayPal is a great fully featured payment and invoicing solution that has been the industry standard for many years. 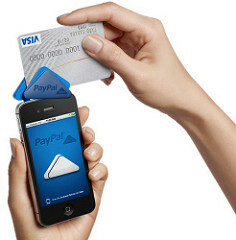 They have recently released their own POS mobile card reader system called PayPal Here which is well worth checking out. Like Square, it is also designed to run on a smartphone or tablet and is thus perfect for quickly capturing sales at markets! Help us choose our next channel integration! Craftybase is built using the feedback and suggestions from our customers. Help us decide which sales channel to integrate with next by letting us know where you are currently selling. If you have any questions or feedback about our new PayPal support please feel most welcome to get in touch.